Fry the lamb mince in the olive oil in a pan or wok. Once browned, remove from the heat and add the onion, red pepper, tin of tomatoes, tomato puree, cinnamon, oregano and garlic puree. Season to taste with salt and pepper. Place half the meat sauce in the base of the slow cooker pot. Add half the rigatoni in a layer on top of the meat sauce. Put the rest of the meat sauce on top. Add the rest of the rigatoni on top of the second layer of lamb sauce. Make the white sauce. Melt the butter in a pan, stir in the flour, cook the roux for 1-2 minutes. Add the milk little by little, whisking well after each addition. Bring to the boil and simmer for 10 minutes until thick. Season the béchamel sauce with salt and pepper and add the nutmeg. Pour the white sauce over the pasta and meat sauce layers in the slow cooker pot, ensuring all the pasta is covered. Cook on high for 4 hours or on low for 6-7 hours. If you have time, leave the dish to stand in the slow cooker for 30 minutes before serving so that it stays together better. Serve by slicing through all the layers with a serrated knife then using a large spatula to serve out portions. 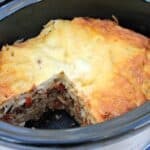 I made this recipe in a 5.7 litre slow cooker.